Brian McBride is, to so many people, a legend. It has also been proven, that he is a thoroughly nice man and a very good people person. He, alongside his wife, Deana, came to the newly refurbished McBride’s lounge on Friday night, marking their first appearance since the lounge opened in his honour. Prior to this, there was a signing in the club shop, featuring Tomáš Kalas, Sheyi Ojo, Sess, KMac and the man himself, Slaviša Jokanović, who was actually smiling. It was terrifying. The evening, hosted by Ivan Berry, kicked off with a montage of Brian’s many great goals for the whites, including crucial finishes against Everton, Reading and Birmingham in the ‘Great Escape’ season, the latter coming in his last home game in black and white. Ivan welcomed Brian and Deana in to thunderous applause and chants of “Brian McBride”, as he worked the aisle he walked down, shaking as many hands as he possibly could before taking to the stage. The interview was split in two halves, the first half about all things pre-Fulham, including short spells at Preston and Everton, as well as covering Brian’s illustrious international career, touching on his inclusion into the USMNT Hall of Fame in 2014. McBride spoke about his experiences watching games growing up, of the 1986 and 1994 World Cups in Mexico and the States, respectively. He also talked at length about his time playing for his nation, spanning three world cups and CONCACAF glory. While on loan at Preston, McBride’s first of many injuries in English football, a blood clot in his arm sustained during his second game, led to him meeting Deana, who would later become his wife. After that point, every football move was decided by the pair of them, Brian making sure nothing was decided before it could be discussed. When David Moyes enquired about bringing the McBrides to Everton, the couple jumped at the chance. On his debut, Brian scored past his best friend, Kasey Keller, a feat he would later repeat on his debut for Fulham. Throughout the evening, Brian seemed very relaxed and at home back in Fulham, always there with a smile on his face and appeared genuinely happy to be back by the river. The half-time break came with a chance for fans to get pictures and autographs from the great man himself. A skill of his, off the pitch, is making whomever he meets feel like they’ve known him for years. I recalled that he made an appearance in the club shop before the Champions League final at Wembley one year, so I went to meet him. He remembered the event, asking if I was the only one there, which I was, before saying “now I know why your face looks familiar”. Such a small thing, whether true or not, makes such a difference to fans. There is no doubt he is very good at meeting fans and making it feel like he is meeting them, rather than they are meeting him. In the second half, Ivan steered the conversation in the direction of SW6, with Brian and Deana’s move to Fulham coming around in January 2004. It was exclusively revealed that Bolton Wanderers had asked the MLS about the services of McBride, and were told his price was set at $1million. Before the move could come to fruition, however, it was raised to $1.25million, which priced them out of the move. Mr Fayed, decided that the price was worth it, and so the McBrides came to London, something they barely had to think about before deciding on. Brian spoke very fondly of his four and a half years with Fulham, of Chris Coleman and Roy Hodgson. What he was most complimentary of, however, was not any achievement on the pitch, but the support both of the fans and Mark Maunders, who helped him and Deana set up in Cobham, near an American school for their kids and who helped with anything and everything he possibly could. When Lawrie Sanchez took over at Fulham, we played in the PL Asia trophy in Hong Kong, with a mandatory photo needed of the manager and captain. No captain had yet been appointed, until Sarah Brookes pulled Brian aside, telling him that Sanchez wanted him to take the armband for the tournament. He later, of course, became club captain officially, despite his final season being marred by a serious knee injury. He revealed the decision to leave Fulham was a very difficult one. The club wanted him to stay on, his family were happy in London, but it would have been more difficult for his kids to adapt back to American education if they did not return that summer. Leaving Fulham was a decision made based on the future of his children; something I’m sure we can all say is the right thing to put first. The evening then turned to questions from the floor, with Ivan sifting through a stack of cards collected during the interval. Brian’s choice of best player he played with was an easy choice of Edwin van der Sar, primarily due to his commitment on the training ground. 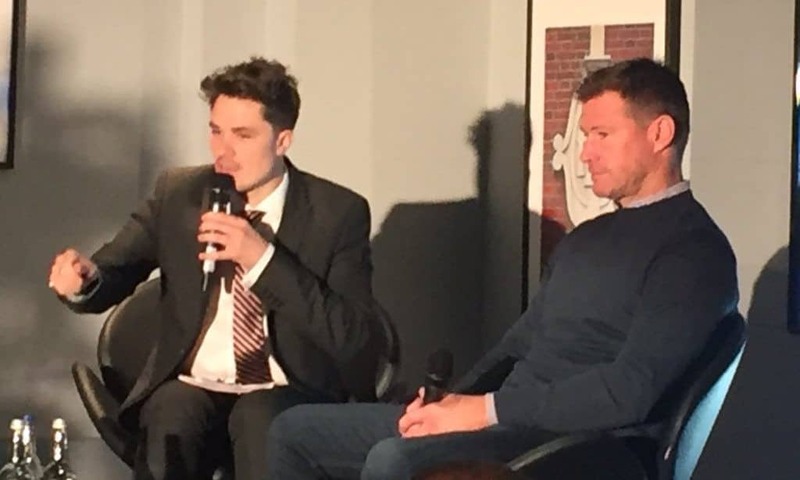 When he was asked about funniest moment involving a teammate, Brian went for his second choice involving Jimmy Bullard and come rubbish bins, as the first story was not repeatable. Jamie Carragher was the best opponent McBride faced. Not only could Carragher always beat him to the ball defensively, he also scored against Fulham, while Brian was marking him, one of only three players to do so. In terms of the best striker to have played for Fulham, despite Andy Cole costing him his place in the starting line-up, Brian decided on Louis Saha, one of the best finishers he ever saw. The quality of Clint Dempsey’s rap career was a very well taken question. Brian insisted Deuce was a very good rapper, but, as it turns out, not good enough to make it onto his iPod. An answer towards of the evening was a question of who Brian would have liked the lounge to be named after, had it not been him. After a long period of thought, he decided the best person would be his first Fulham manger, Chris Coleman, with a fair amount of agreement from the crowd. Finally, it was revealed that during one of Danny Murphy’s first training sessions with Fulham at the start of the 2007/08 season, McBride was tasked with marking him. Danny mentioned that nobody ever let him win a header… The rest, as they say, is history. Chief Operating Officer of the Roy Hodgson fan club.